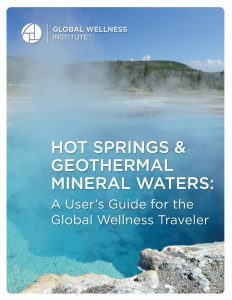 As the Hot Springs Initiative, our intention is to connect the global community of hot springs and geothermal resources by raising awareness of this unique and distinct segment of global recreation, health and tourism industry (community). The following are a list of helpful resources. The “dial” below is an interactive inforgraphic which helps the user find hot springs locations in various countries. View dials have been created for: Australia, Austria, Canada, France, India, Iran, Japan, New Zealand and United States. They can and will be generated for other countries in the future. The intention of these dials is to help create awareness that there are hot springs all over the globe and to seed in the minds of hot springs visitors that they can include hot springs in their travel itineraries. How to use the interactive Hot Springs view dial: Below is the view dial for Australia. You will see that each arrow that goes from the center map to the outside circle represents a hot springs property. The name of the hot springs property is given on the arrow as is the distance and directions from your starting point (“datum point”) to other hot springs all over the globe. The “datum point” hot springs is marked in red on the maps. While this example infographic for Australia that you are seeing is not “clickable,” you can download a PDF file version and then you will be able to reach the websites of each of these hot springs properties. Click on the country view dial to download the high resolution PDF file. Each Hot Springs property on the view dial will have an embedded link to its website.